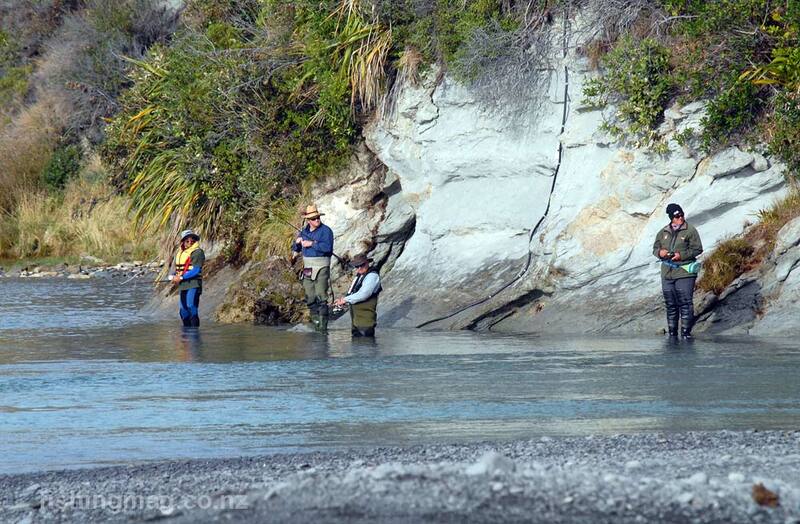 One good thing about the Hurunui River surf is that it is quite often fishable even when the Waimakariri and Rakaia Rivers are in flood. 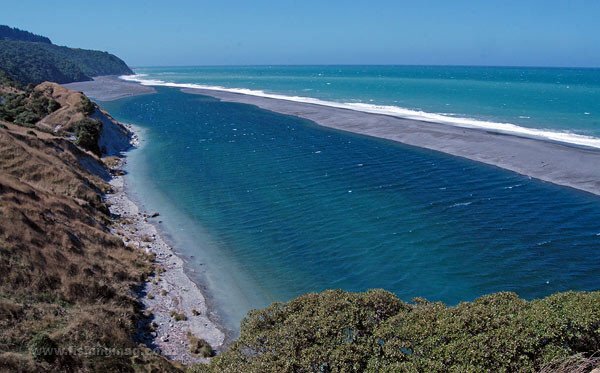 The trip to the north side of the Hurunui River mouth from Christchurch is about 100km and takes an hour and a quarter by car. 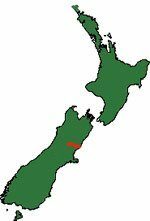 Whereas a trip from Christchurch to the south side of the Rakaia River mouth is about 80km it would take similar travelling time. 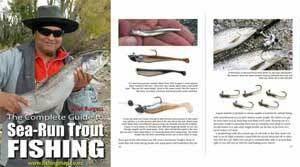 In both cases, there is going to be some walking involved to get to the mouth proper and into a good fishing position. 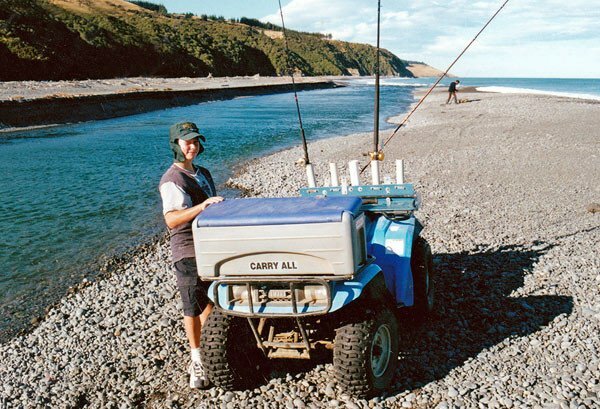 Salmon fishing at the Hurunui River mouth is excellent, and very consistent, some years, whilst other years it can be patchy at best. 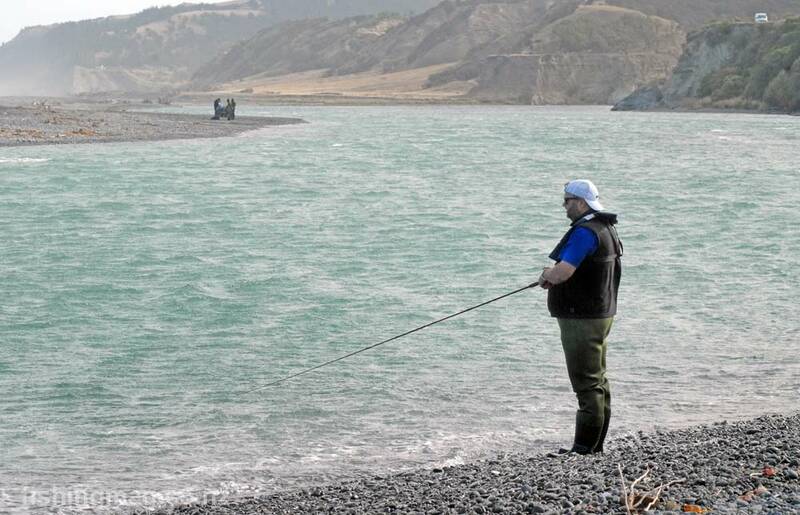 I have done very well fishing at the Hurunui River mouth for salmon on the occasions I have travelled there. 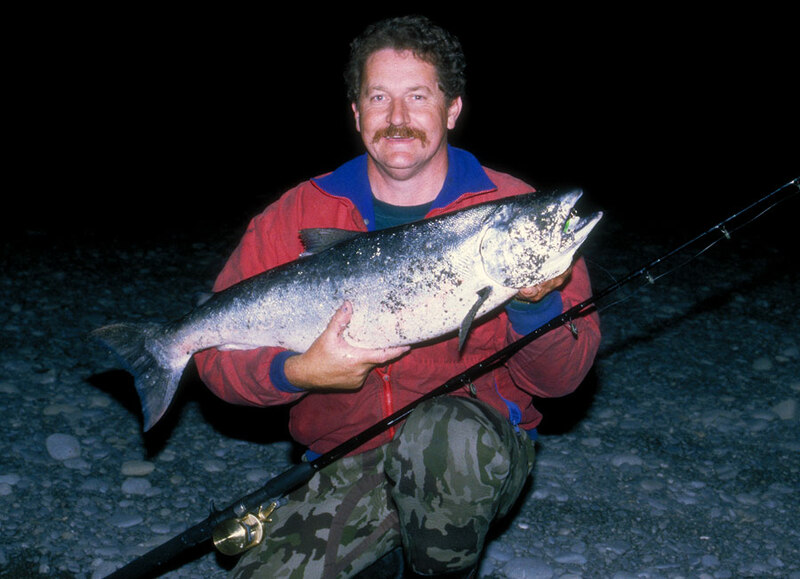 I have caught a salmon in the surf, at the mouth, on almost every trip. 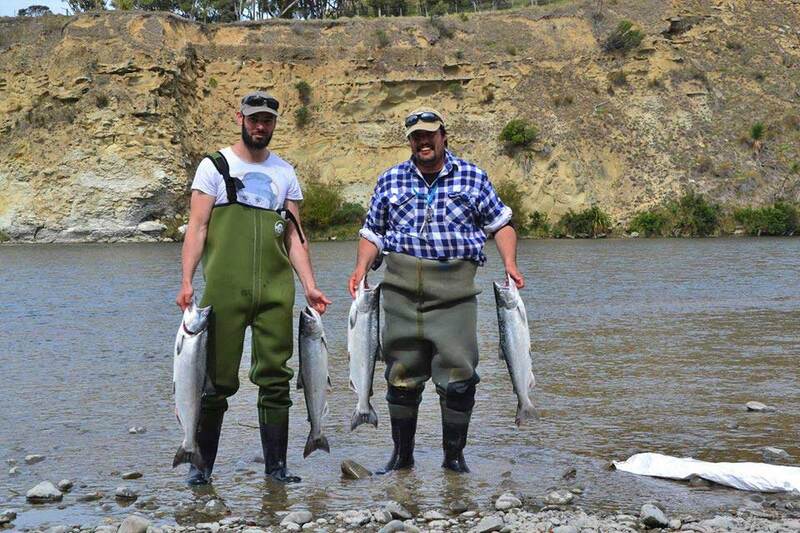 I remember catching a salmon in Hurunui River lagoon one evening while they were porpoising (showing their backs out of the water) around. 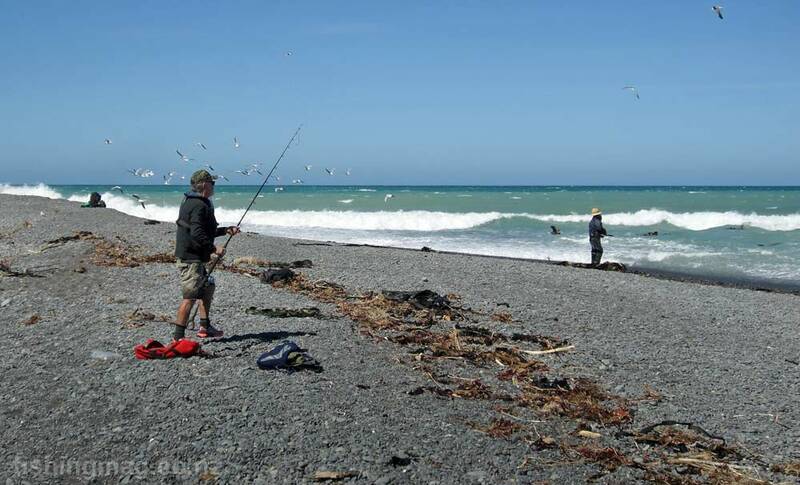 As a rule, you will need a long rod if fishing the Hurunui River surf in order to get casting distance out over the breakers. If there is a bit of a swell running the salmon fishing can still be very good as the sea is quite deep off the mouth. You have to watch for sweeper waves coming right up the beach while you are fishing. In such conditions, a life jacket or flotation device is a must. Don’t go too far down the beach towards the water. Instead, cover the distance to where the fish are with a long cast of your ticer. Sometimes you can see the salmon riding up and down in the swell. Sometimes the Hurunui River can be clear and fishable whilst the other major Canterbury salmon rivers are running high and discoloured. 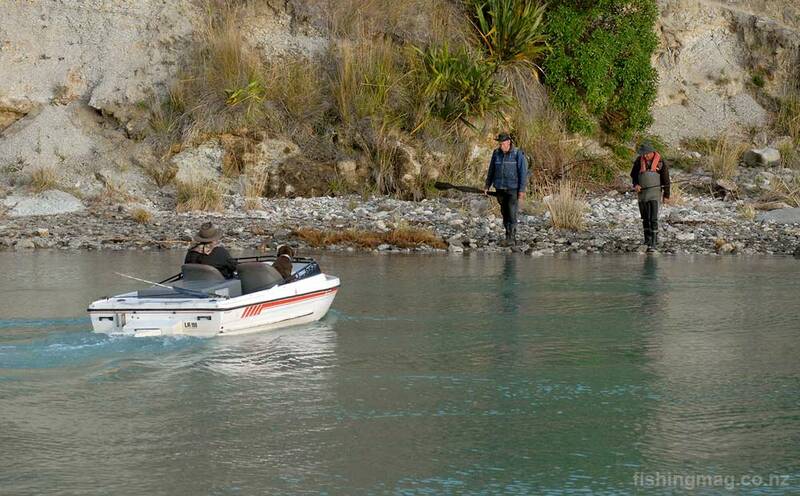 You should always check River Flows Canterbury for river levels before leaving home to go salmon fishing. 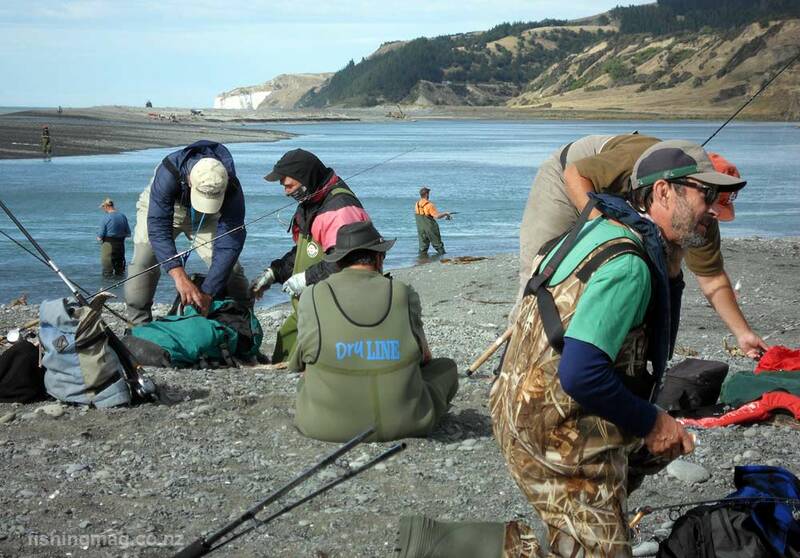 According to Fish and Game optimal trout fishing condition for the Hurunui River is when the flow is reading between 10-30 cumecs at the Mandamus recorder. 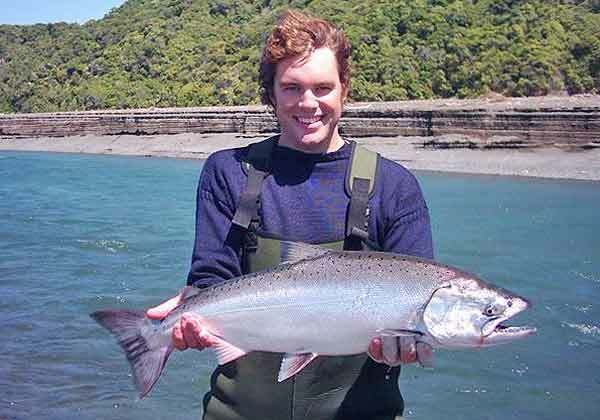 When the river is very low and clear there is a good chance that salmon will be milling about in the surf waiting for the river to rise so the surf at the river mouth is always worth a try for salmon during the season from November to April. This view illustrates the methods used to get to the best salmon fishing at the end of the shingle spit. 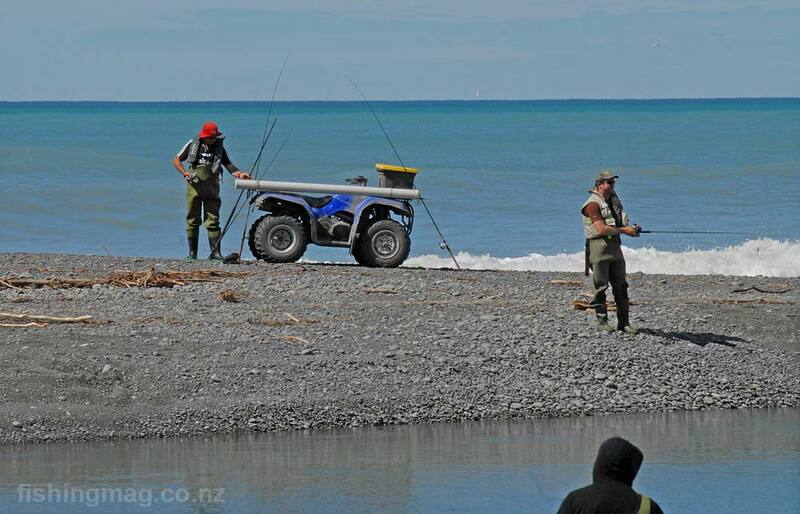 Some anglers have crossed the lagoon by dinghy while others have travelled north from the Blythe Valley by four-wheeler motorbike. View over the Hurunui River mouth looking south-west from the cliffs above the camping ground. The red x on the left shows Nape Nape Beach about 3km away. The red x on the right marks the Blythe River Valley Road about 1.5km distant. View from the cliffs above the camping ground looking north-east over the lagoon. In this photograph taken in mid 2014, the river mouth is at the far north-east end of the lagoon. You can make it out in the distance. 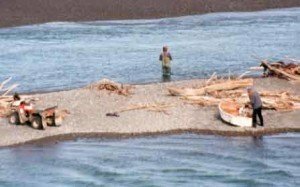 One this that has always struck me as odd about the Hurunui River mouth is that I have caught salmon there on several occasions when I was the only angler present. 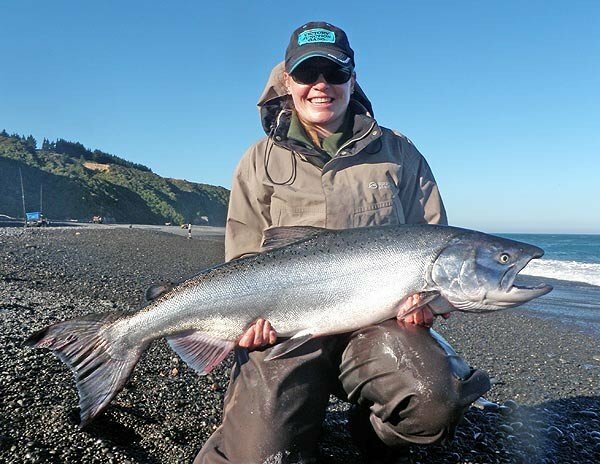 I’m talking mid-week during the salmon season when the river and sea are clear and fishable with a clear blue sky overhead, even in January and February. 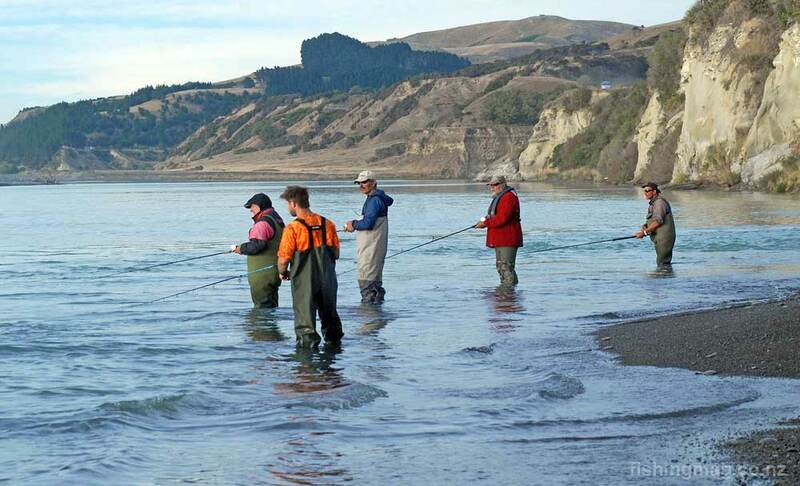 Some salmon are caught in the gut on occasionally, as well as further upstream, but generally, the salmon fishing at the Hurunui takes place in the surf. 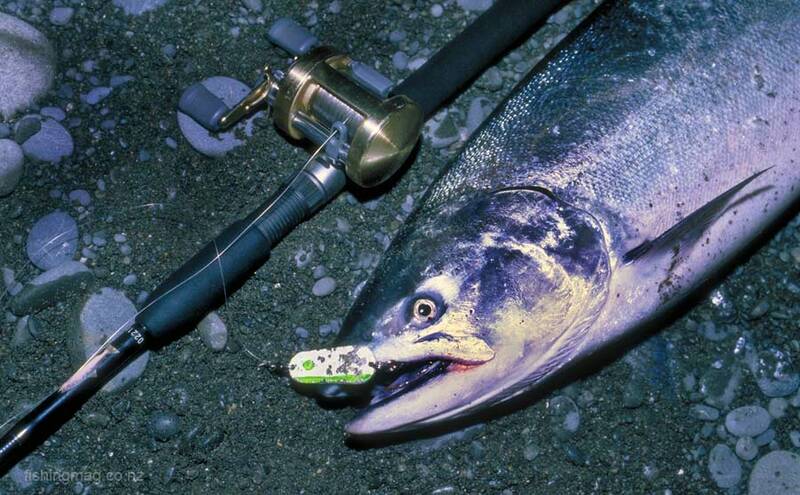 There is also good sea-run trout fishing early in the season. The brown trout fishing all the way up to Lake Sumner is also good if you have the time. 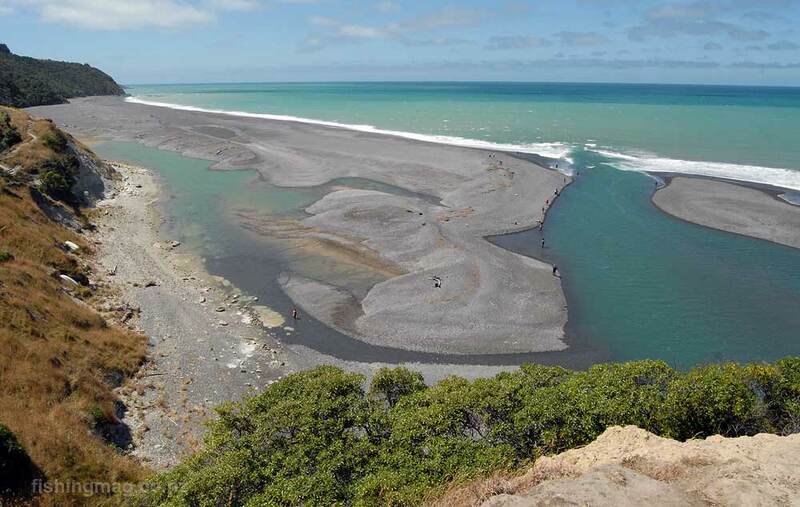 This second view of the mouth of the Hurunui River was taken on the same day. 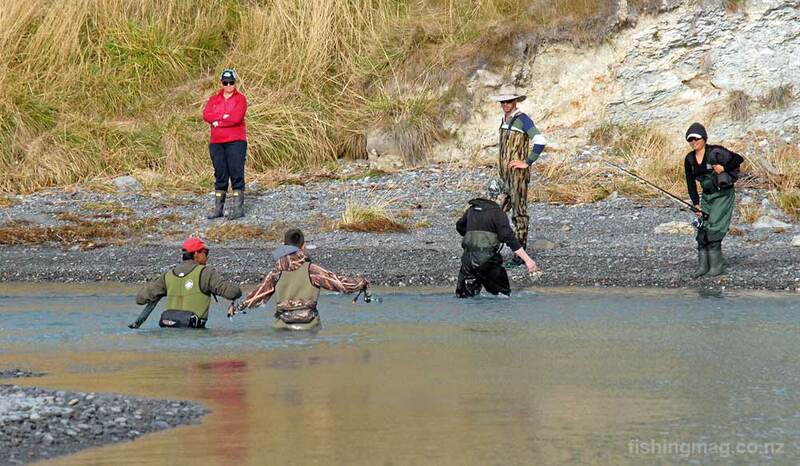 Note how one angler, who has arrived from the south on the red motorbike, is fishing the gut in the green waders. The second angler has just crossed the lagoon in his dinghy. 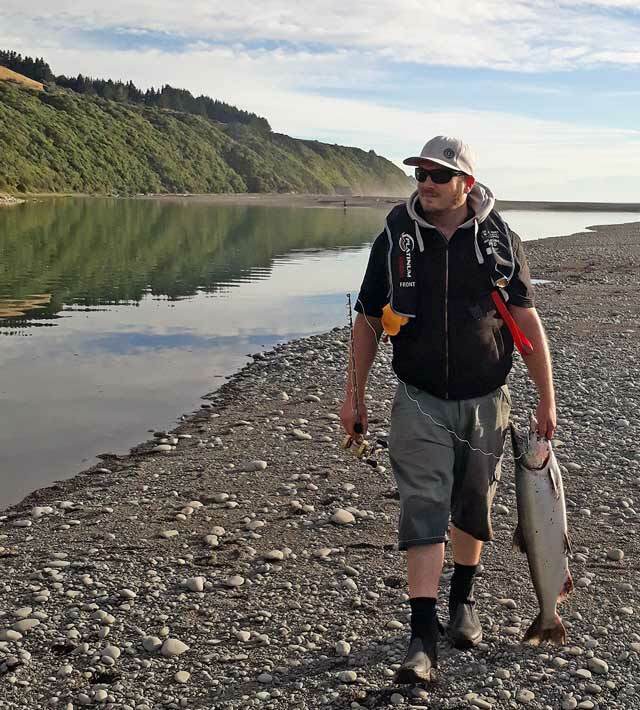 Like most of the big South Island east coast, salmon rivers access is hard work on foot if you want to fish right at the mouth. Access to the river mouth proper depends on where the river is exciting the lagoon. 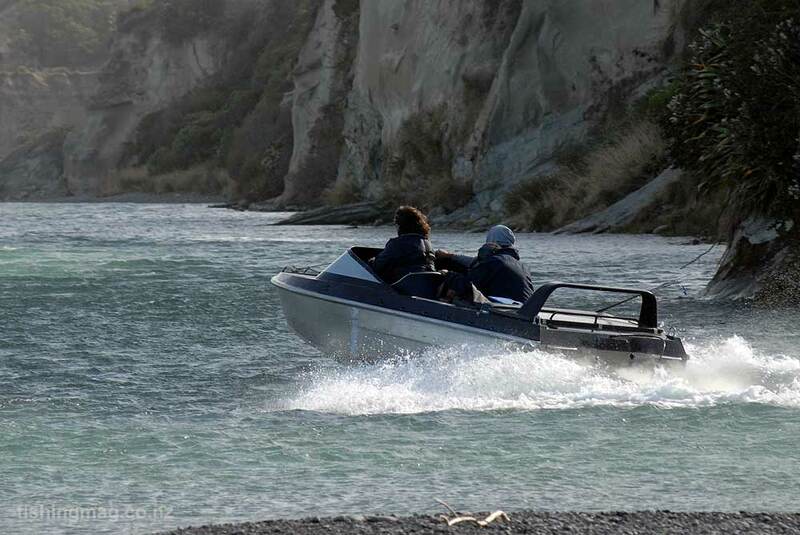 A small boat is a big advantage for getting across the lagoon to fish the surf. Otherwise, it can be a long walk around the lagoon depending on the hight of the water. If the mouth is close to the camping ground on the north side anglers will sometimes be able walk part way around the lagoon and then wade across. I have always arrived at the mouth by quad bike down the shingle spit from the south side. This involves travelling down the Blythe River Valley Road towards Nape Nape. Parking at the beach, unloading the quad from the trailer and riding down the beach to the mouth. To get to the campground on the north side you have to turn off SH1 at Domett. Anyway depending on the location of the mouth along the shingle spit access can sometimes be difficult and involve a bit of walking. If staying at the camping ground a dinghy or kayak would be a definite advantage. 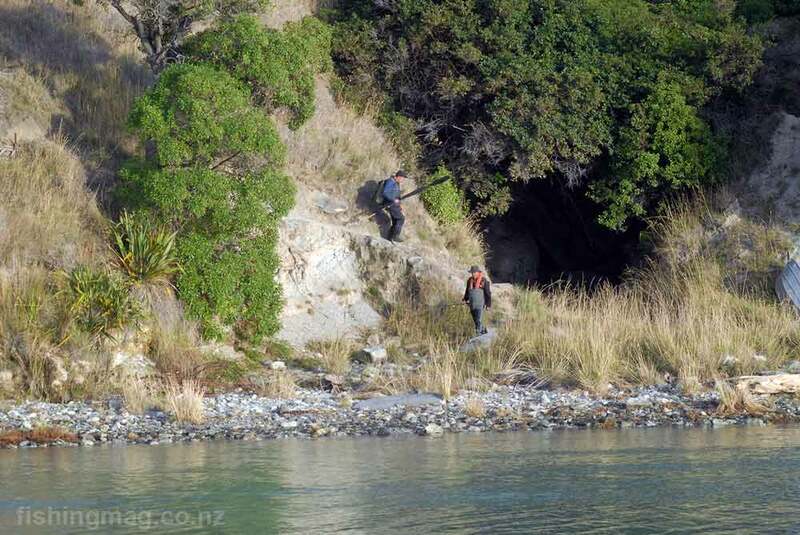 Access to the mouth of the Hurunui River for salmon anglers can be a bit challenging. 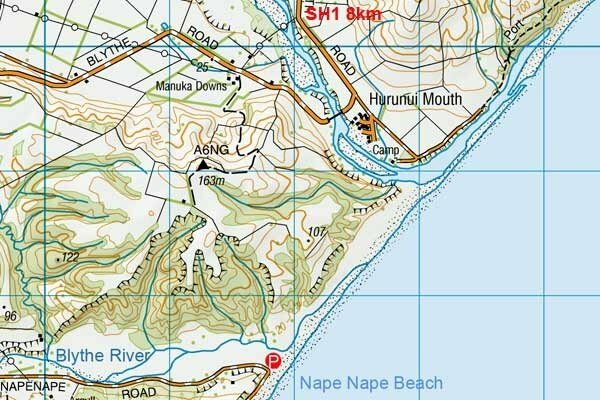 If you have a quad bike and want to fish the surf with a long rod from the end of the shingle spit the best way of approaching the Hurunui River mouth is to turn off on State Highway One and follow the road to Nape Nape Beach . This shingle road follows the Blythe River Valley Road from the highway to the sea for 17km. When you arrive at the beach leave your car parked at the corner marked with the letter P in a red circle on the map. Then ride your quad off your trailer and along the beach to the river mouth several kilometres to the north east. 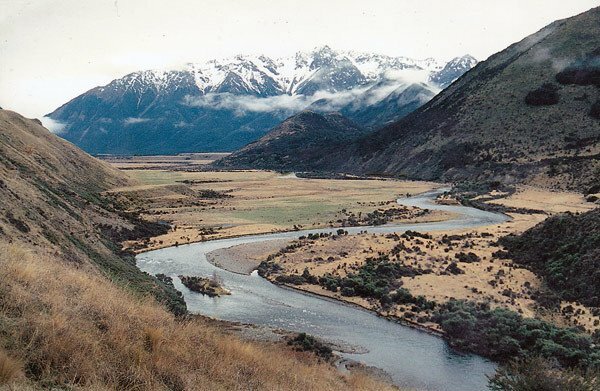 You can check up-to-date river flows here at the Environment Canterbury website. 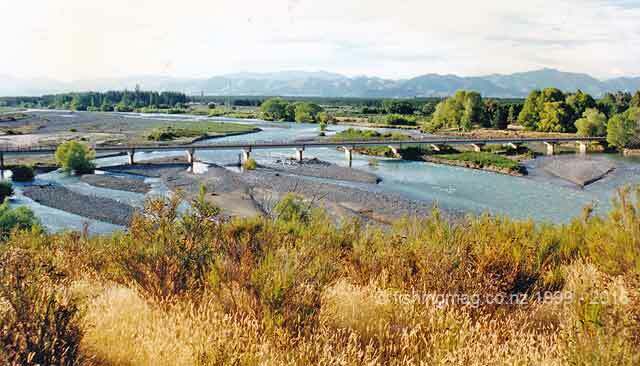 The Hurunui River is generally fishable once it drops below about 40 cumecs. 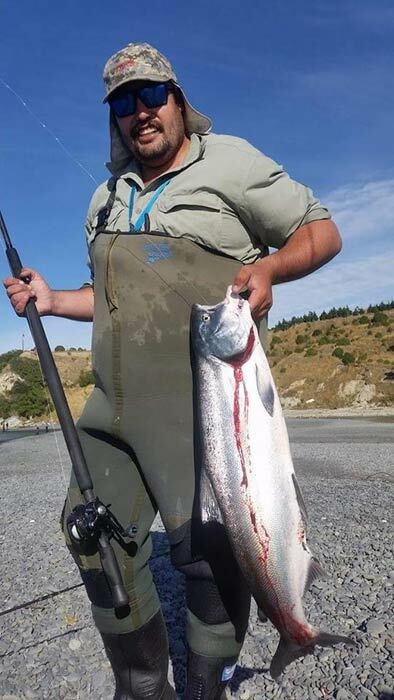 If you check on the Environment Canterbury website and the Hurunui River flow is 70 cumecs plus although the river will be quite unfishable there may well still be good salmon fishing in the surf on the south side of the river mouth. 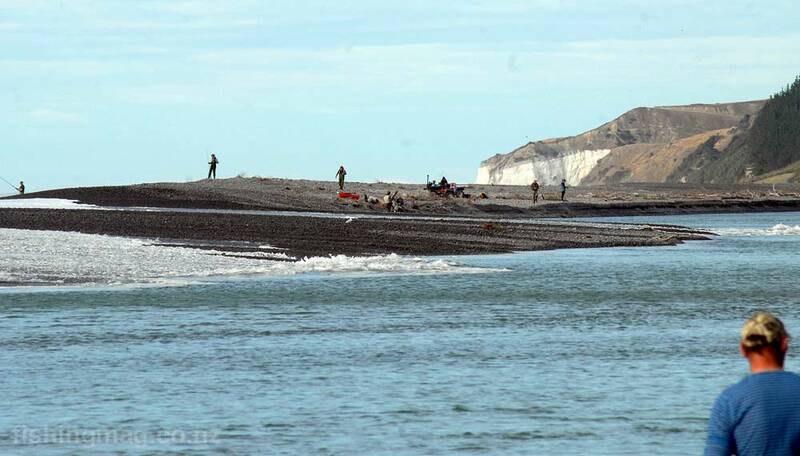 The surf is much deeper off the Hurunui River mouth than at the other big Canterbury rivers. 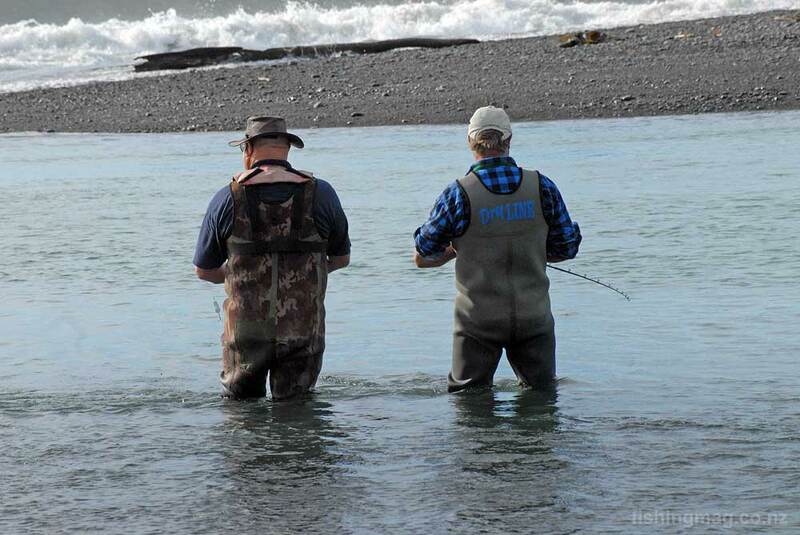 Salmon can still be caught in the surf at the Hurunui River mouth even when there is a two-metre plus swell running. 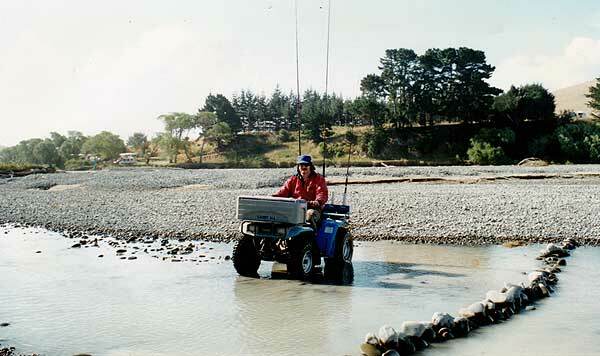 The Hurunui River also tends to clear quickly following a flood. 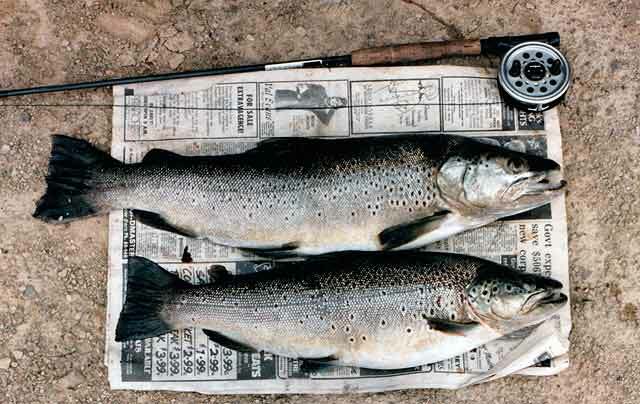 Even if the river is high it may be good in two or three days for trout fishing. 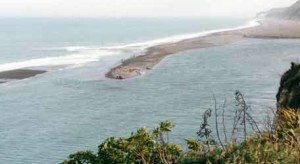 If you have a four-wheel-drive Toyota Hilux, or something similar, and are competent at driving along a loose shingle beach, you might wish to save your legs and drive the last couple of kilometres up the beach. The spit can get very loose and narrow at the end so you might be better to walk the last couple of hundred metres or so. Be warned however that this beach takes no prisoners when it comes to eating four-wheel-drives. Some years ago a mate of mine attempted to drive his recently acquired Nissan Safari 4×4 down to the Hurunui River Mouth along this beach. He managed to get some distance down the shingle when his truck started to sink deeper into the loose stones. Unfortunately, his mag wheels weren’t up to the strain. He had plenty of engine power but his axles kept spinning while his mag wheels remained locked tight in the stones. He had to send an urgent message back to Christchurch for a set of steel rims and tires to be sent up before his truck could be rescued! You could walk all the way from the road a distance of some 2 km. I have done this myself in the past. The loose stones are a devil to walk on but so long as you are not is a hurry the walk will take about 40 minutes. 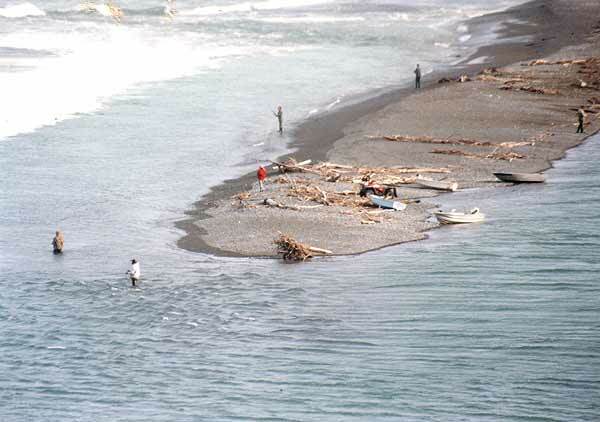 If you are determined to fish the surf from the camping ground you can walk around the northern end of the lagoon. It is also possible to wade a fair way across when the river is low. This is always a bit tricky however in case the river should rise when you are on the far side. 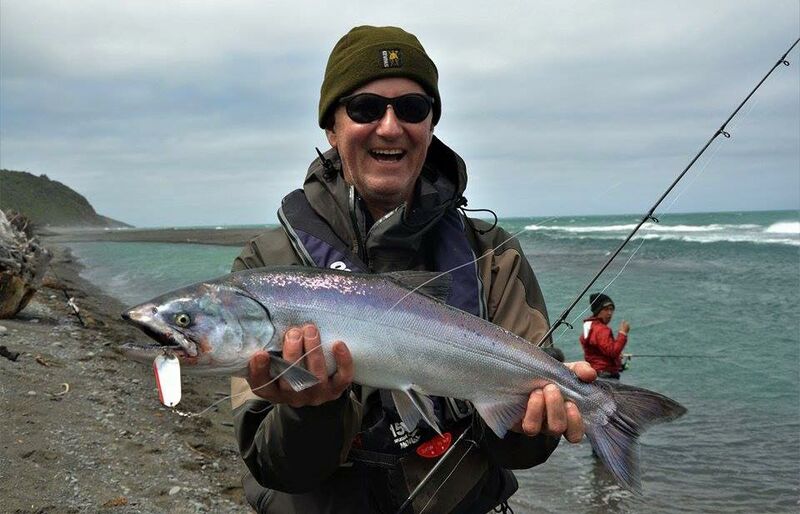 The best fishing from the spit is almost always from the southern side where you can also fish the gut – the last bit of the river where the two spits overlap. The walk from the camping ground around the northern end of the lagoon is almost as far as the walk along the beach from the Nape Nape end. Another way of getting to the spit is by rowing a dinghy across from the camping ground. This is quite popular with campers for obvious reasons. It goes without saying that if rowing across be sure to wear your life jacket. 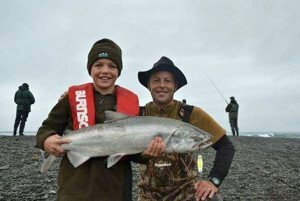 On the subject of life-jackets many salmon anglers now wear emergency inflatable life vests. These are worn over the shoulders and tied around the waist. They have a rip cord that is pulled should you be unfortunate enough to fall in. A small Co2 cylinder inflates the vest when you pull the rip cord. Their big advantage is that they provide a high degree of protection without the bulk of a normal life jacket. 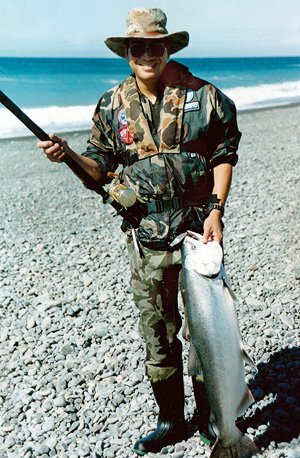 You can see one of these being worn in this photograph of Keith Chin with a Hurunui River salmon. The camping ground is some 8 km from the State Highway One turn off at Domett on a sealed road. The Blythe Road is metal only and harder on your vehicle. The camping ground is basic with just a toilet and water tap. It can get quite crowded at Christmas time.